1x - Aromini BT in Black. 1x - 120ml Oud Saphir. 1x - 120ml The Hotel. And get 5 FREE scent samples! Package Deal AroMini BT, Oud Saphir, Santal, The Hotel (+5 free samples). Combine your AroMini Bluetooth with a hand-picked bundle of 100% essential and aroma oils, perfectly paired to provide the ideal scenting experience. This package includes an AroMini BT, three luxurious aroma oils (Oud Saphir, Santal, and The Hotel), and five free samples to try. The AroMini Bluetooth diffuser is designed to allow you to diffuse your aroma oils with ease while being whisper-quiet, sleek, and stylish. This powerful diffuser preserves the integrity of the essential oils you choose and provides quality scent in your home or office. Its Modern Black color looks great in any setting. Suitable for areas of around 1,000 square feet. The AroMini Bluetooth has a 24/7 timer and is Bluetooth connected. Requires 120ml bottle to fill. For the most flexibility and control over scent diffusion, the AroMini Bluetooth is the right choice. Sleek and minimally designed, this freestanding diffuser features state-of-the-art Bluetooth technology. Its made from 100% recycled aluminum to be environmentally friendly, and it conserves oil and energy with a 24/7 timer and intensity control you can connect to your smartphone. This diffuser uses a unique cold-air technology that releases nanoparticles into the air, leaving no residue behind. The integrity of your aroma and essential oil is preserved to give you the most complete therapeutic and olfactive benefits without using heat or evaporation or diluting your oils in alcohol or water. Diffuser Benefits and Key Features. The AroMini Bluetooth uses nebulizing technology, a heat-free method of diffusing your favorite Aromatech essential and aroma oil blends. Our diffusers enhance your health and well-being by purifying the air as they release nanoparticles of pure essential and aroma oil blends, scenting your space delicately and beautifully. Theres no easier way to create an inviting and unique ambiance and receive the maximum benefits from your essential oils. 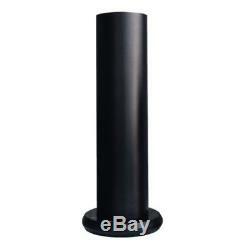 Uses cold-air diffusion technology, which requires no heat. Scents any space up to 1,000 square feet. Features adjustable scent intensity controls. Features an easy-to-use 24-hour timer. Is made from recycled aluminum. Uses a 120ml bottle of AromaTech aroma oil. Requires no mixing or diluting of aroma oils. Comes in sleek and attractive Modern Black. When you use the AroMini Bluetooth, your scent is diffused through nebulizing technology, which breaks down the aroma oils into a very fine mist. This mist is dry and will not leave any oil or residue on your furniture. It preserves the integrity of your oils while giving you the maximum olfactive and therapeutic benefits. The nanoparticles in the mist remain suspended in the air for hours, enhancing your home or offices ambiance and providing you, your family, your employees, or your guests with the therapeutic benefits of essential oils. This package comes with three rich, luxurious, and sensual aroma oils: Oud Saphir, Santal, and The Hotel. These three scents fill your home or business with sophistication and mystery, creating an inviting and intoxicating environment where guests will want to linger. A lovely fragrance with notes of fresh lemon zest, bergamot, red raspberry, and cassis as well as hints of jasmine, white lily, and red rose. Sweet vanilla and amber sandalwood add depth and luxury, while black pepper and musk provide the finishing touch. Oud Saphir is an incredibly heady scent that evokes a rich, sensual mood. Santal is a bold, aristocratic scent reminiscent of the mystical feel of an open fire in a deep wood. Its aroma is leathery, smoky, and musky, and includes notes of cardamom, musk, and papyrus. A beautiful cocktail of red rose, lavender, geranium, eucalyptus, and pine, The Hotel is a cheerful blend that includes notes of citrus and juicy peach. This lovely scent calls to mind exciting evenings at the Delano Hotel in Las Vegas: classy, luxurious, and sensual. All three of the aroma oils youll receive with this package are created with the highest-quality natural and raw ingredients blended perfectly to work with the AroMini Bluetooth. We combine these aroma oils with pure, non-GMO, vegan essential oils that contain no phthalates, parabens, glycols, petrochemicals, artificial additives, artificial colors, or any other harmful chemicals. Our diffuser blends are completely safe for your home or office, family, employees, visitors, and pets. The item "AroMini BT Home Scents Bundle" is in sale since Monday, July 9, 2018. This item is in the category "Home & Garden\Home Décor\Home Fragrances\Essential Oils & Diffusers". The seller is "aromatech" and is located in Phoenix, Arizona. This item can be shipped to United States, Canada, United Kingdom, Denmark, Romania, Slovakia, Bulgaria, Czech republic, Finland, Hungary, Latvia, Lithuania, Malta, Estonia, Australia, Greece, Portugal, Cyprus, Slovenia, Japan, China, Sweden, South Korea, Indonesia, Taiwan, South africa, Thailand, Belgium, France, Hong Kong, Ireland, Netherlands, Poland, Spain, Italy, Germany, Austria, Israel, Mexico, New Zealand, Philippines, Singapore, Switzerland, Norway, Saudi arabia, Ukraine, United arab emirates, Qatar, Kuwait, Bahrain, Croatia, Malaysia.